He is a Member of Rios International Scientific Council and Former Faculty Member of University of South Australia, Charles Sturt University and Monash University, Australia He has worked as Post-doctoral Research Fellow at Lucknow University and IIT (Delhi and BHU). 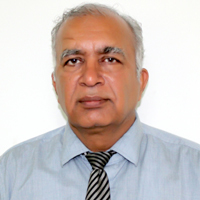 Dr Harsh has around 102 research papers to his credit published in journals of International repute or in Conferences. Dr. Harsh has a wonderful academic career of working as an academician in all the three fields namely Physics, Engineering and Computer Science. He has been the Ex-Dean and Professor of Computer Science ECMIT, Dubai, Vice Chancellor of Tantia University, Sri Ganganagar, Group Director of Amritsar College of Engineering and Technology, Director of Hindustan College (Sharda Group) and Dean (Research) of Rayat Bahra University. Dr Harsh has been involved in distance education (including research, guiding and teaching) for more than seven years. Most remarkably, he has done his research work with four internationally recognized scientists: Prof K.S. Srivastava, Professor R.N. Singh, Prof B.K. Agarwal and Professor Martin Green. One of his important achievements came when in a ceremony at the Kanpur University, ex-President of India and sitting Vice-President, Dr K. R. Narayanan, awarded first Doctor of Science degree to Dr. Harsh in 1990. It should be noted that earlier the Kanpur University conferred an honorary D.Sc. to Professor Sir C V Raman. Prof Harsh spent continuously 17 Years in foreign countries including majority of time in Australia. He has More than 38 years of Academic, industrial and research experience. He has been widely involved with various universities of UK, USA and South Asia for the courses development, articulation agreement and various other academic activities. His most valuable internationally acclaimed research work has been on Semiconductor Plasma Physics, Software Engineering, Software Reuse and Management, Information Systems and Quality of Education. He has been honoured by various organizations including Brazil’s scientific council. He was awarded prestigious “Rashtriya Gaurav Award” which was conferred on Aug 29, 2012 in New Delhi by India International Friendship Society. He was also awarded “Best Citizens of India” award by International Publishing House in recognition of exceptional calibre and outstanding performance. Dr Harsh has supervised excellent research students who are working in various positions across Australia, India and US. He has also written and edited couple of general articles published in the various magazines and newspapers across the globe.